Homemade Zuppa Toscana is an Italian soup full of kale, potatoes, bacon, and sausage in a creamy broth. It’s an easy stovetop comfort food that's also gluten free! 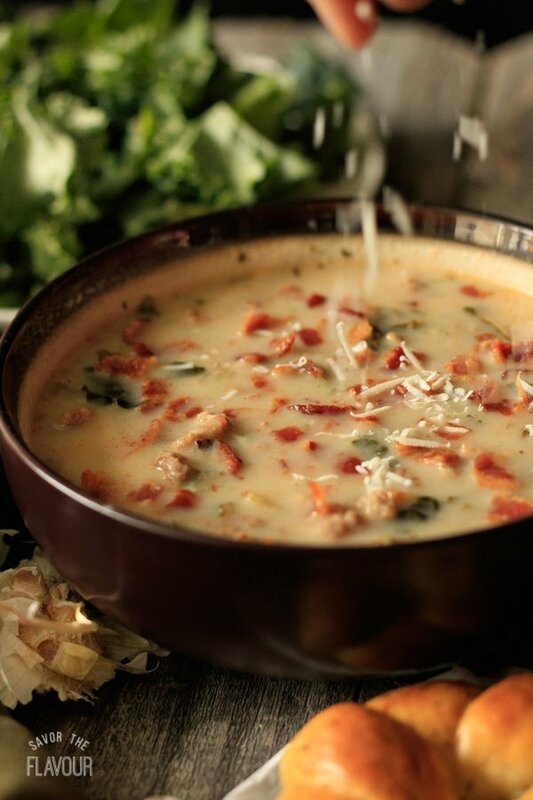 Zuppa Toscana soup is a comforting soup that is wonderful to eat on a cold, winter day. Its name is roughly translated as “soup in the style of Tuscany.” The first time I remember eating Zuppa Toscana soup was at a friend’s house. 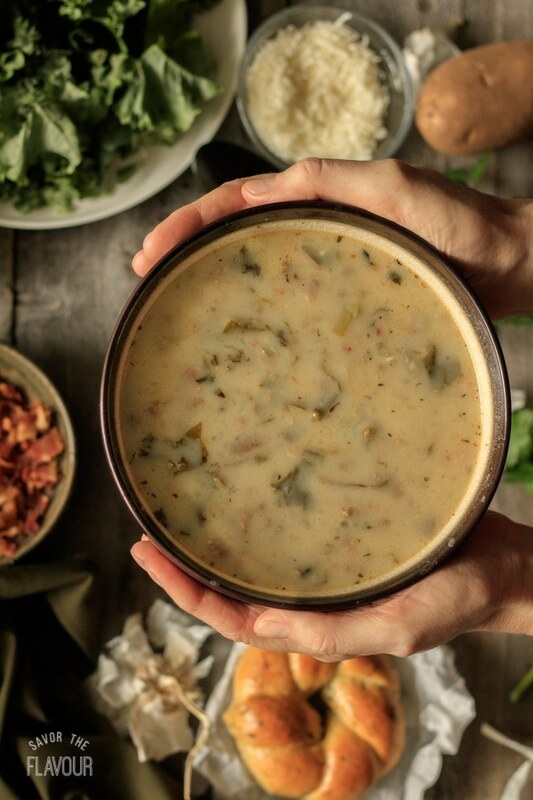 Maybe you are a dedicated fan of this soup from Olive Garden. 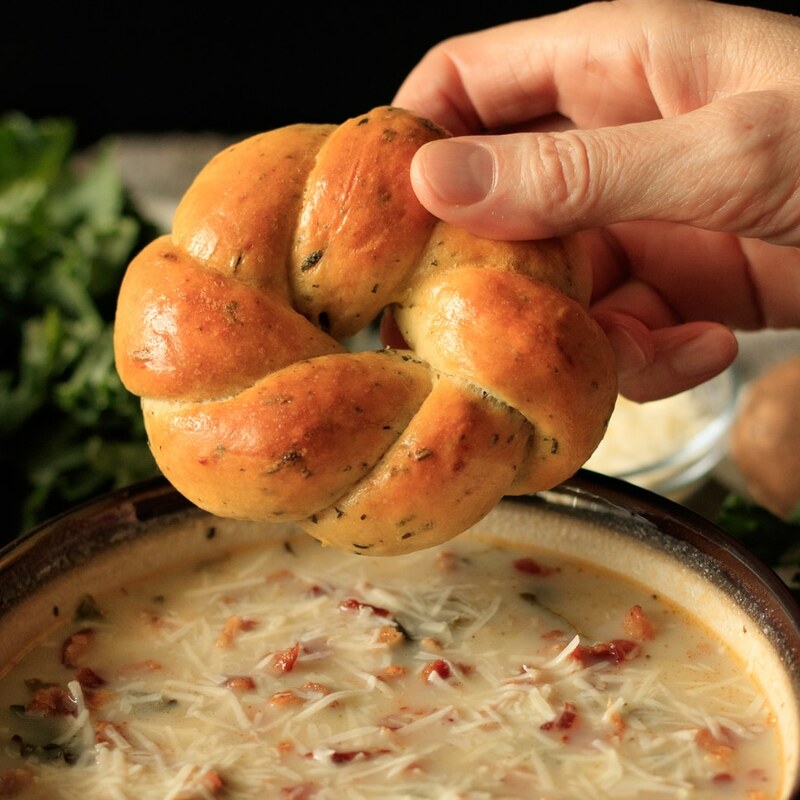 😊 I’ll let you in on a little secret: it’s so easy to recreate this delicious soup in your own kitchen. Here’s how it’s done. To save time, start with frying the Italian sausage and bacon in separate pans. Dice up your onion then saute it in bacon fat. Yummy! 😋 Sprinkle in your spices, stir, and cook until fragrant. In a large soup pot, pour in the chicken stock and water. Add the sliced potatoes, and onion mixture. Stir well to combine. Cover and bring to a boil, then simmer for 15 minutes. 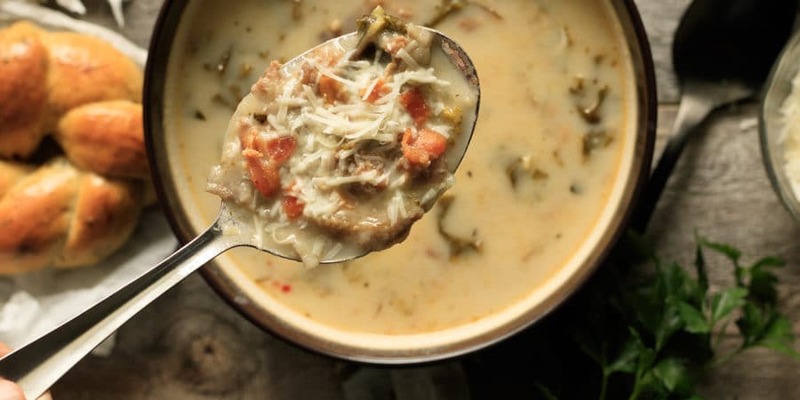 Add the kale, and let this fantastic soup simmer for another 10 minutes. Finish this off with adding the heavy cream and the Italian sausage, and heat through. Garnish will the crumbled bacon and freshly grated Romano cheese. Looking for a tasty bread to serve with Zuppa Toscana? Try our beautiful garlic and Asiago twists, which feature fresh garlic in the bread. Homemade Zuppa Toscana is an Italian soup full of kale, potatoes, bacon, and sausage in a creamy broth. It’s an easy stovetop comfort food that’s also gluten free! In a large skillet, cook the Italian ground sausage. Sprinkle the red pepper flakes and stir. Drain to separate any fat. Put in a medium sized bowl. In a large soup pot, fry the bacon until crispy. Drain on paper towels. Pour bacon fat into a small bowl. Return two tablespoons of fat into the soup pot. When cool, crumble into small pieces. While the sausage and bacon is cooking, dice the onion. Wash and slice each potato lengthwise and then in half. Cut 1/4 inch triangles. Put in a large bowl. Saute the diced onion in two tablespoons of bacon fat until soft and translucent. Add all the spices, stir and cook one more minute. Pour in the chicken stock and filtered water into the soup pot. Add the cut up potatoes. Stir well. Cover the pot and bring to a boil, then simmer for 15 minutes. Take a potato masher and mash some of the potatoes, this will thicken the soup naturally by releasing more starch into the soup. While the soup is simmering, measure out the 5 cups of packed Kale. Cut or tear into smaller pieces. Grate the Romano cheese and put in a small bowl to use as a garnish. Add the Kale. Simmer for 10 minutes. Stirring occasionally. Add the heavy cream and the Italian sausage. Stir well, and let it heat through for 5 minutes. Serve warm and garnish with grated Romano cheese and crumbled bacon. This recipe is a mild version. Feel free to use hot Italian sausage or to add more red pepper flakes to your soup if you enjoy things on the spicy side.